Progressive Web Apps (or PWAs for short) aim to deliver a better and engaging user experience by applying progressive enhancements using modern web standards and best practices. These include among others service workers, push APIs, background sync and serving your page over HTTPS. 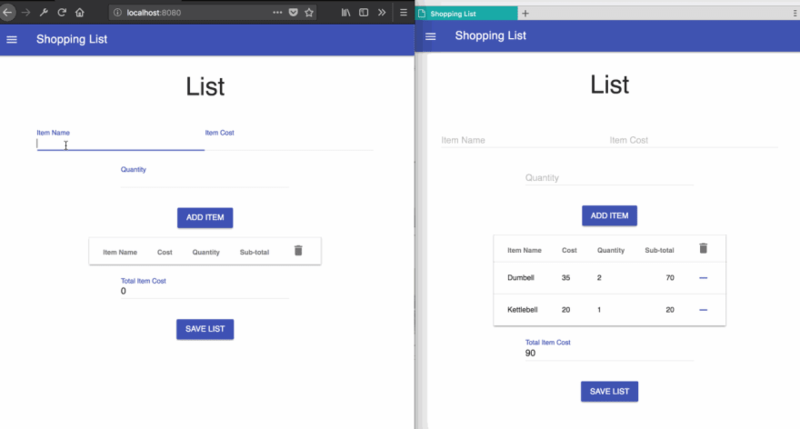 We’re going to walk through building a shopping tracker PWA which will introduce you to working with Service Workers, the Cache API, and Hoodie. To follow along, you'll need to have Node.js and npm installed. The app allows adding items with their prices to the list, save it, and see a summary displayed on a separate page. One of the main features of a PWA is the ability to work offline as well as online, hence, we need to apply the concept of offline-first to the application. Offline-First is an approach to software development where lack of network connection is not treated as an error. You start by developing it to work in areas with no internet connection. Then as users enter areas with network connection or as their connection speed improves, the application is progressively enhanced to make more functionality available in the app. For this tutorial, we want to be able to add and delete data when users are either offline or online. This is where Hoodie will help out. The first functionality we’ll be adding allows users to add new items. There’s a file named index.js in public/js/src.. It contains functions for displaying items saved to Hoodie in the page. Edit the index.html by adding references to index.js and the hoodie client script before the </body> tag on line 197.
message: "All fields are required"
When this script is loaded in the browser, it calls init() which fetches all items saved locally by calling hoodie.store.withIdPrefix("item") and renders them on the page by calling addItemToPage(item) for each item retrieved from the local store. We subscribe to the add event on the item store using hoodie.store.withIdPrefix("item").on("add", addItemToPage). With every new item added to the store, it calls the addItemToPage function. When the Add Item button is clicked on the page, it calls saveNewItem to save the data. To remove items from the store, you call hoodie.store.withIdPrefix("item").remove(itemId) with the ID of the item to remove. Modify index.js adding the following content before the init() call. <button class="mdl-button mdl-js-button mdl-button--icon mdl-button--colored"
We can see that our list works and data is saved. But this data is only stored locally and not persisted to the server. How do we make it push data to the server? With Hoodie, data is only persisted when the user has been authenticated. When users are authenticated, data is saved locally first, then pushed to the server and synchronised across other devices the user is logged onto. Let's add this needed authentication. We already have markup for login, logout, and register as part of the content for index.html which you cloned. Check it out if you want to take look at the markup. We defined a register function which calls hoodie.account.signUp() with a username and password. When it’s successful, it calls hoodie.account.signIn() to log the user in. Also we added login and signOut methods to sign in and sign out, respectively. These APIs for authentication live in hoodie.account. The method updateDOMWithLoginStatus() updates the navigation bar to display different links based on if the user is authenticated or not. The GitHub repo you cloned already has a system.js file in public/resources/system.js. We also installed Babel as part of the dependencies (see package.json), and a Babel configuration file (see .babelrc). "build": "babel public/js/src --out-dir public/js/transpiled"
Removes all items from the item store so new ones can be added. We’ll summarize lists with the price and the date it was added on a different page, history.html. The script to handle this is in the file history.js in public/js/src/ of the completed code on GitHub. I have omitted showing this code here for the sake of brevity. The code is similar to what we’ve written up until this point. Nice work, it’s really coming together! Now let’s discuss adapting our application for seamless offline usage. So far we’ve been able to save and view data. This works when the user is offline and even when the server is down, then it’ll sync to the server when there’s a connection. However, at the moment we’re going to see an error when we try to load the page while being offline. Let’s fix that by utilizing Service Workers and the Cache API. A Service Worker is a programmable network proxy, which runs on a separate browser thread and allows you to intercept network requests and process them as you so choose. You can intercept and cache a response from the server and the next time the app makes a request for that resource, you can send the cached version. It runs regardless of whether the page is currently open or not. We’re going to add a Service Worker script which will intercept all network request and respond with a cached version if the resource refers to our page and its related assets. This resources will be cached using the Cache API. The Cache API, which is part of the Service Worker specification, enables Service Workers to cache network requests so that they can provide appropriate responses even while offline. This code will first check if the browser supports service workers, and then register the file sw.js as the service worker script. Run the build script again (npm run build) and refresh the page. 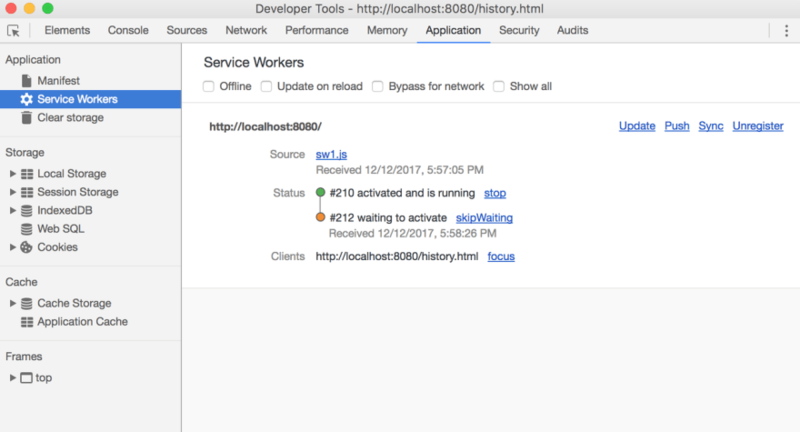 Registering a service worker will cause the browser to start the service worker install step in the background. It is at this install step that we want to fetch and cache our asset. If the asset is successfully cached, then it is installed and move to the activate step. If it failed, the service worker will not be installed. The activate step is where we need to delete old caches of our assets so our service worker can serve updated resources. After the activation step, the service worker will control all pages that fall under its scope. The page that originally registered the service worker for the first time won't be controlled until it's loaded again. All these steps (install and activate) that happen after registration are part of the life cycle of a service worker. You can read more about these concepts later. We call caches.open(CACHE_NAME) which opens or creates a cache and returns a Promise with cache object. 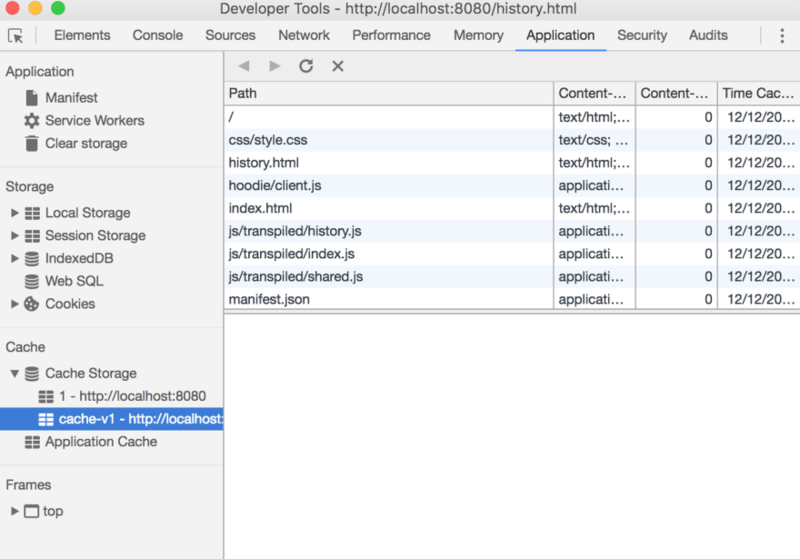 Once we have that object, we call cache.addAll() with an array of all the things we want to cache to make the app load while being offline. 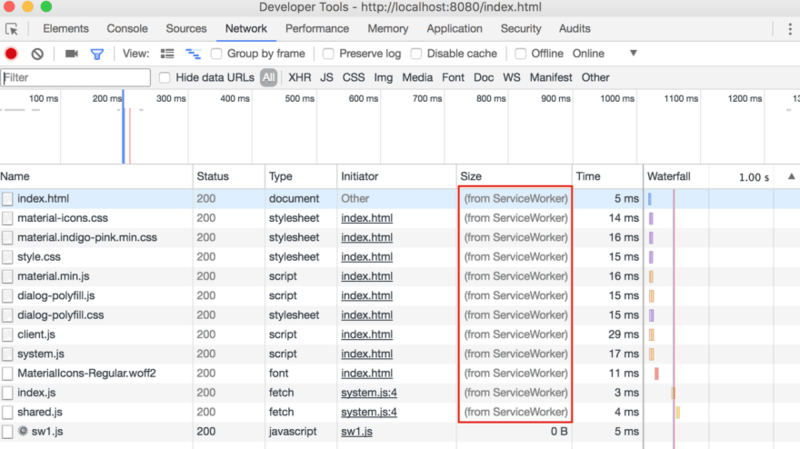 The call is wrapped in events.waitUntil which tells the browser not to terminate the service worker until the Promise passed to it is either resolved or rejected. A Service Worker can be terminated by the browser after a while of being idle and we need to prevent that from occuring before we are done with our caching. We’ve added our assets to the cache, but we need to serve the browser our cached asset each time it makes a request for one. To do this, we listen to the fetch event which is called each time the browser is about to make a request. We’ve used event.respondWith(), a method of FetchEvent. It prevents the browsers default handling of the request and returns a promise of a Response object. Our implementation either returns the response from the cache if it’s available, or makes a formal request using the Fetch API and returns whatever we get from that response. Click the skip waiting link to immediately activate it. We built a basic shopping tracker application that works offline. Offline First is a core part of progressive web applications and we’ve tackled that with Hoodie and Service Workers. 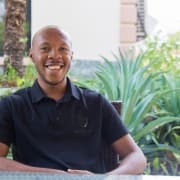 Hoodie provides the backend to easily build an offline-first app that synchronises the data among the server and all connected devices. Service Workers allow us intercept requests and respond with cached results. For browsers that do not support service workers we will gracefully fall back to working like a normal website. 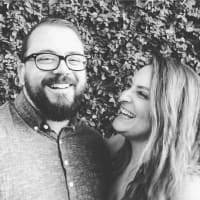 We don’t quite have a complete PWA yet, however, we’ve just laid the foundation. 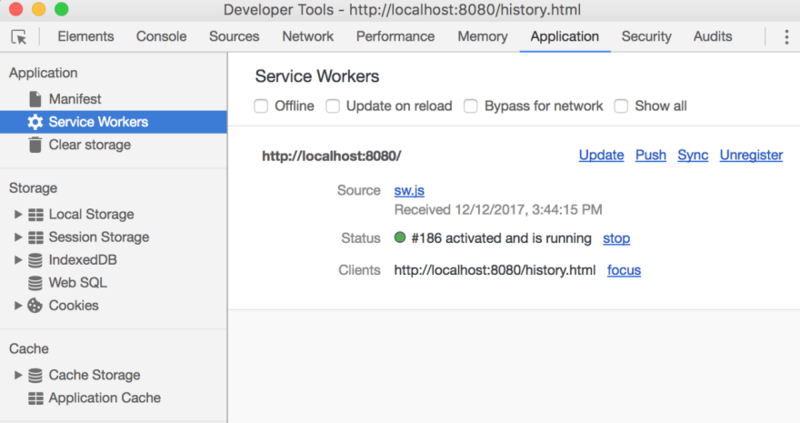 In another post, we'll look at some other bits you need to make it a PWA and some helpful tools to generate what you need (including using workbox to generate a service worker script). Stay tuned! You can find complete source code of the final application on GitHub. If you’re confused about any of the things I talked about in this post, please leave a comment and feel free to reach out to me on Twitter (I’m happy to connect and see what you build next 🚀). Software Developer with experience building web apps and services in JS and C#. I'm passionate about building quality software, with interest area around Offline First and Software Architecture. Thanks for this tutorial. Just wanted to point out that in the section when adding the list of files to cache it threw an error due to history.js not existing in the public/js directory, which leads to no transpiled version of it being created. In the section Saving the Shopping List and viewing History I stated that you can optionally copy that file from the completed code on GitHub and add it to your working directory. If you didn't, it'll just raise an error which doesn't affect the working of the app. I'm interested in how the user authentication is handled. Mainly in storing usernames and passwords on a client device to auth against.